Designing characters can be so much more than just creating a 'cool' or 'appealing' image. True innovation comes from digging deep into your character's personality and their role in your story! It's not too much of an overestimation to say that character design is one of the most sought after positions for freelancers and studio artists. Designing characters all day is an amazing, fun and inventive process that allows for a lot of rough exploration and idea generation, so it's no wonder that so many people want to pursue it as a career. To become truly excellent, I believe it's important to weave the character's central concept/conflict into their visual identity! 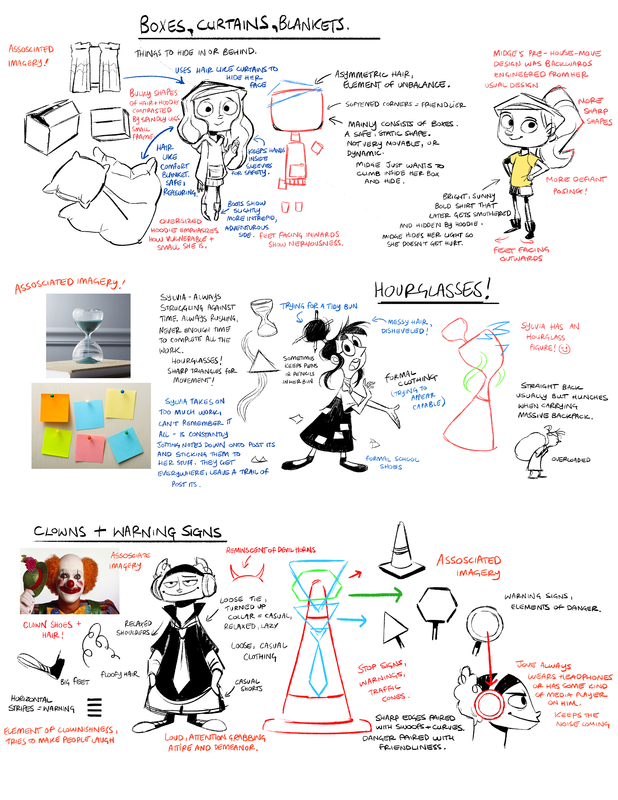 I'm not a professional character designer, but I wanted to talk a little about the way I go about designing my characters and why I do it that way! Hopefully it will help people avoid some of the common pitfalls. Please feel free to share your tips and advice in the comments below, too. I would love to hear your thoughts and techniques! The most obvious and common pitfall is designing a character just to look 'cool'. A character should be designed around a function or personality! Sonic is designed to look cool, sure - but he is also designed to be the fastest thing allliiiiiive! Hence the 'blown back' spikes (from running so fast, obviously) reminiscent of comic speed lines, his red racing car sneakers, and the endless triangles in his designs! You should have known I would use Sonic as an example. I love Sonic. More about shape design later! His cool attitude is exemplified not only through his design, but through his pose. Getting inventive with the way the character stands or sits, using that to squeeze the most personality into your design you can is key! No more t-posing or facing the camera with hands by your sides. Have fun with it. How would your character sit, stand, wait, run? All of this is part of the design of the character, not just the job of the animator. When you think about iconic characters like Bugs Bunny, Superman, or Jafar, they all have poses that they call to your mind. An important thing to note too is that they are all confident characters. However, the way that this comes through in their posing is very unique to each - they all hold themselves completely differently. So, a side effect of having no true idea of purpose or function to your character, and of designing them simply to look appealing is festooning your character in stuff that clutters up their design. Needs more belts! Try to give any accessories your character has a reason for being there. It could be environmental - maybe if they live in a harsh world, they need to wear/equip some kind of day to day protection. Maybe it's something that was given to them and has sentimental value. Maybe it's a relic of their past. Maybe it demonstrates their personality. Whatever it is, use it as a way to deepen the world or the character. If it doesn't have a function, your character design might be better off without it. Using Midge from my comic The Girl and the Glim as an example, I chose to give her two accessories. One is a friendship bracelet, and one is her brother's old hoodie. Midge is a character whose core conflict revolves around the fear that people won't like her. The bracelet represents how valuable friendship is to her as well as being an indication of her past, a reminder that moving house means she has left her friends behind. The hoodie is a familiar object that Midge uses to hide herself from others. It helps me a lot when demonstrating her shyness and gives me lots of nice posing options that are unique to her as a character. The style you choose to design your characters in will vary depending on the story you are designing them for. Your target audience will also play a big role in these decisions! Setting Stranger Things in the 80's had no functionality story-wise. The same story could easily have been told with a modern day setting. However, the creators/designers knew that the story was targeting the generation who grew up on The Goonies and ET, and wanted to evoke that nostalgia in their audience, and so they chose to set the story within this time period to create the kind of mood and atmosphere they felt would connect with their audience. Each of the styles here communicate something different about the story's intent. The Ghibli style character top left is unlikely to be involved in the same kind of story as the screaming Arin Hanson caricature below her. Likewise the far right Unicorn's world will be very different to the bird girl's below. Choosing a style that communicates is important, as establishing audience expectation and then not living up to that promise can cause a knee-jerk reaction from your readers/viewers (though you can also deliberately use it to create twists!). Just as important is being consistent with this style. A pet peeve I have is when a show or comic will have a lineup of characters, 90% of which are consistent with one another, but then have one design that will completely throw off the aesthetic of the show. I don't have a problem with designs being broad and having more variety in lineups is something I am strongly in favor of. However, if you're going to make zanier design choices, you need to sprinkle that throughout your world, rather having just one character following a different ruleset. In the above screenshot, Tomohiro the larger character has a head that is disproportionately large and cartoonish compared to the rest of the cast. I think it's great that they included a character with a larger body type, but it feels like he is from a different movie. This dissonance kept pulling me out of this fantastic movie, which is a shame. I think they could have pulled his facial design more in line with the rest of the cast to avoid this problem. Also - go and see A Silent Voice if you get the chance, it's a wonderful film! for example, if you are deliberately making the statement that this character is not of this world, and doesn't belong. However in general you should try to keep your style consistent in order to keep your world feeling believable. You can read about the Golden Theme in this post! To summarize, it's the message you want to communicate through your story. This theme should permeate the story and characters alike so that everything is working to convey this meaning to your audience. To explain exactly what I mean, I'll use the terrifying horror movie Jaws. For anyone who hasn't seen it, the plot revolves around a giant great white shark that is attacking tourists at a beach and the Police Chief Brody's plight to stop it. The theme of the movie is To face your fear is to conquer your fear. Therefore, they needed a character who was afraid of something. Chief Brody is scared of the water. But how can he face this foe? Well, let's give the water teeth. That's Jaws! When Brody defeats this embodiment of fear, he overcomes it. His last line of the movie is 'You know, I used to be afraid of the water'. To dig a bit deeper into how you can use your theme visually, I'll use The Girl and the Glim as an example, as I can talk about it from the inside out. I don't want to give away the actual thematic statement I'm working to, as it's the entire reason I'm telling the story - but I can say that in order to demonstrate the theme it is necessary to build my characters around the fears they keep deep inside themselves. So how would I go about expressing this through the designs? First I had to really understand my character's fears, and then look into associated imagery. For example, a character who highly values freedom may be fashioned after a bird, or have a wing motif worked into their design, because we often associate birds and flight with freedom. Therefore, we could leverage that pre-established connotation to communicate this about the character. What is the crux of your character? The characters all have their own reasons to be scared of these things, though I won't go into that here. The important thing is that knowing those fears are integral to the theme, we know that they need to be prevalent in the visual designs. As well as that, it's important to consider what you want to communicate through your character, as well as what your character wants to communicate to the world. So let's get into the nitty gritty of how I start doing that using associated imagery! Using this kind of image association can help you to get away from more generic character designs and find interesting motifs to incorporate into your character. The viewers/readers might not immediately see where the parts came from, but this subtle imagery should work subconsciously to convey the character's personality. You can find some more notes on character acting and contrast in this post on Spending Time with your Characters! You know when you get a new pair of shoes, and there is a brief period, before you go outside for the first time and get them covered in mud and scuffs and gosh knows what else, where they look unsettlingly clean? Well, the same thing happens with characters. They are clinical and unconvincing unless they in some way show the wear and tear of life. This wear and tear can come in the form of emotional hangups or physical 'scars'. It essentially just means dirtying them up a bit, not having them be perfect and pristine. Midge's hand-me-down hoodie, Sylvia's mess of post it notes or constant ink stains, Jove's habit of finger drumming - all of these things are elements that make the characters feel like they have lived beyond the boundaries of the narrative, and have found their own way to cope with things. Consider what day to day things your character does that would have a mental or physical impact on them and then give them a visual symptom to indicate that quirk. For example, Jove listens to music all day. Therefore when he is not listening to music, he will replay the songs in his head and drum the beat out with his fingers, determined to drown out the silence. These aspects tie back into his character fears and make him feel more human, as a character with habits driven by his own internal psychology. Next update, Mike is going to talk a bit about colour choice in character design/how to use colour choice to tell stories. I'm pretty excited to read it, seeing people use colour well blows my mind.